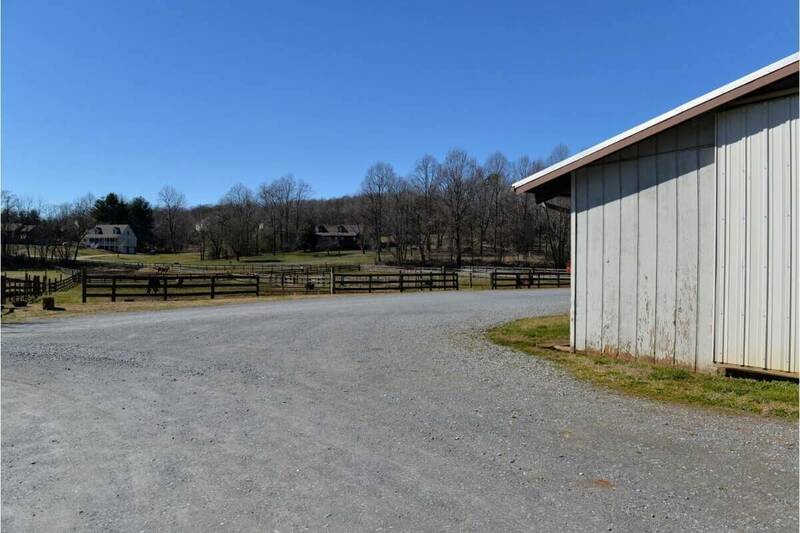 This offering is superbly located in the Boonsboro area of Bedford County and Lynchburg City, VA and is surrounded by low-density, upscale, residential homes which lend a special ambiance and appeal to the site. 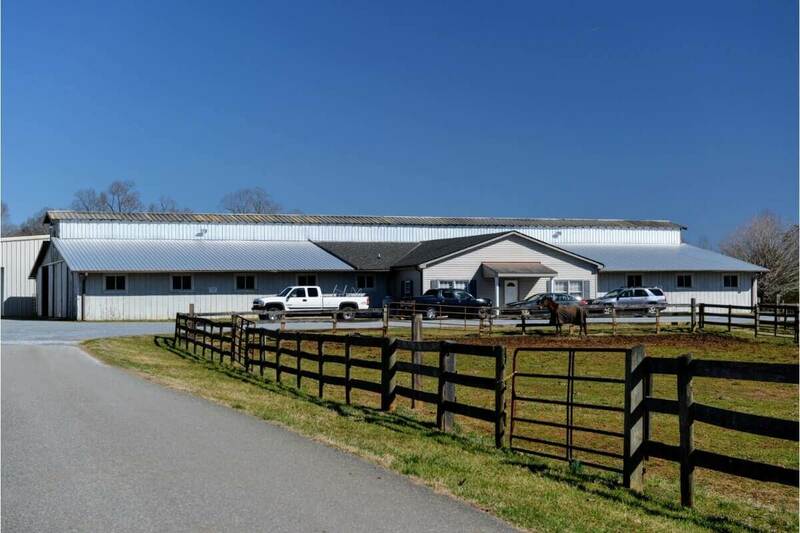 Major highways to and through the Lynchburg Metropolitan Area are only minutes away (US 501, US 29, US 460) and I-81 and the renowned Virginia Horse Center in Lexington are only about 30 miles to the west. 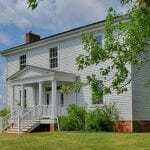 The Lynchburg Metropolitan Statistical Area (MSA) is composed of the Cities of Lynchburg and Bedford and the Counties of Amherst, Appomattox, Bedford, and Campbell. 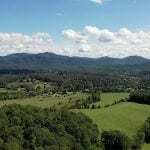 The greater Lynchburg MSA is a dynamic and growing region with much of the recent growth being generated by universities and colleges such as Liberty University, University of Lynchburg, Randolph College and the Central Virginia Community College system. 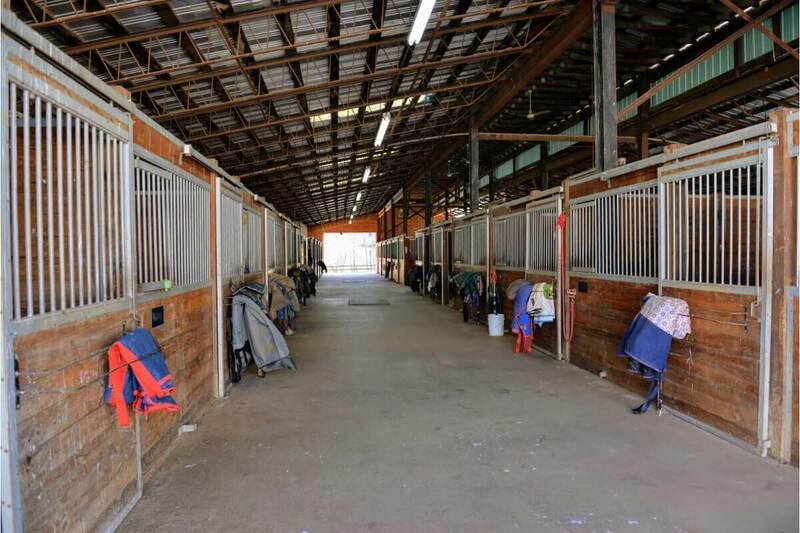 Northwind’s 37,000 square feet under roof is on approximately 18 acres of moderately rolling to open pasture land, enclosed and divided into paddocks and workspace areas by wooden fencing. 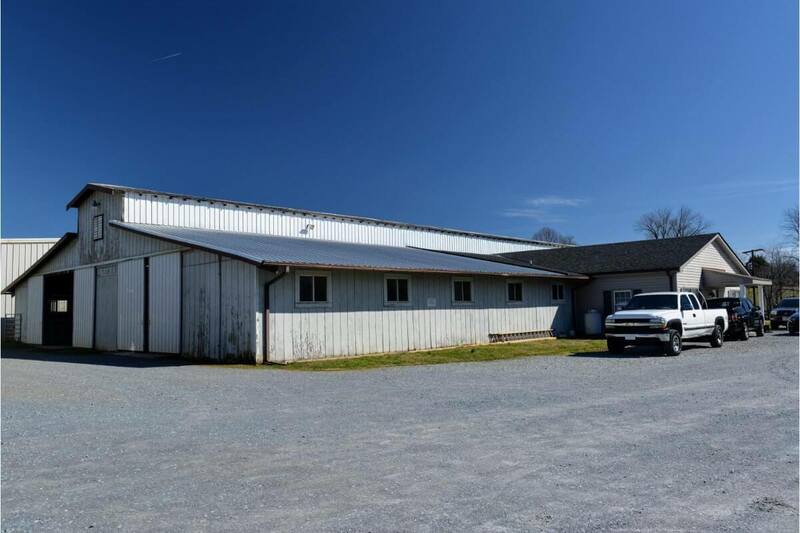 The property is on Coffee Road (S/R 644) and only about 1 mile southwest of US Route 501, and it offers 4/10 mile of road frontage. 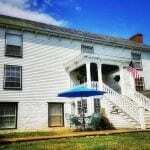 There are two entrance/exit points for the overall property—a main entrance directly from Coffee Rd. and a secondary entrance directly from Huntingwood Blvd., a configuration which provides great ease of access, especially for vehicles with horse trailers. Such convenient access would also support increased vehicular activity in connection with special events/shows at Northwind. 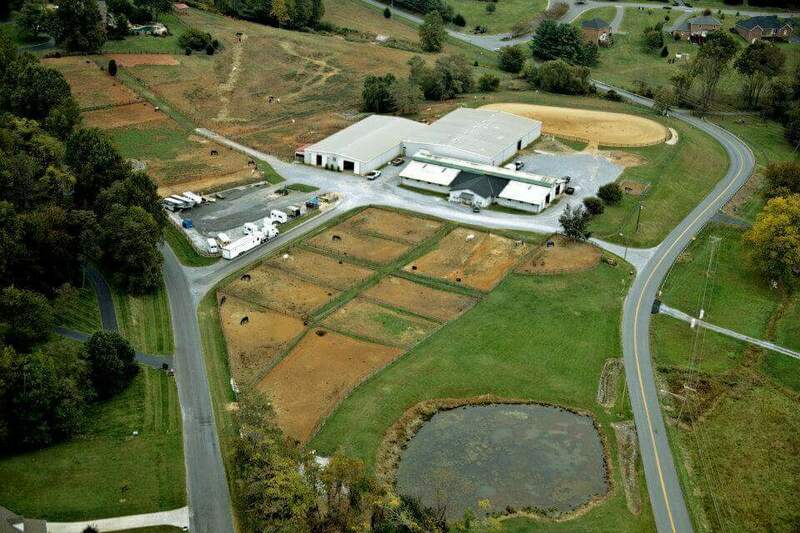 Parking is ample, and has supported recurring events in the past, such as the well-known “Bull Bucking in Boonsboro” with up to 1,200 persons attending. 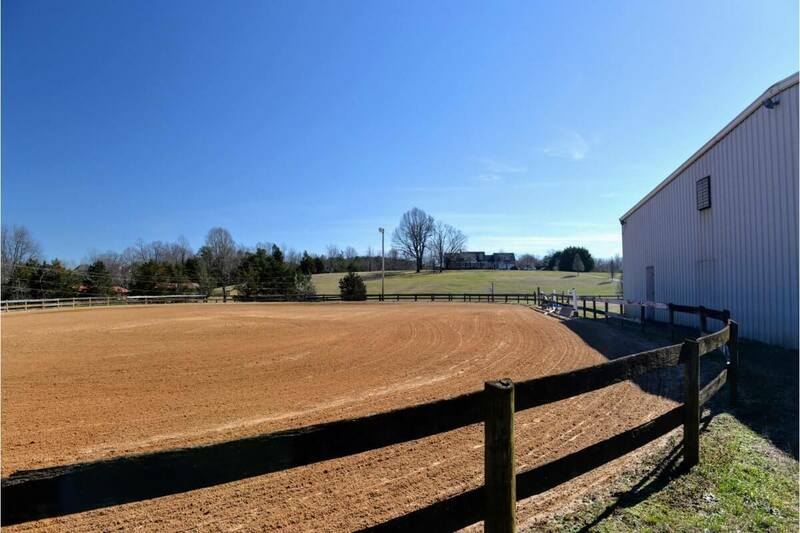 And, very importantly, the property is served by Bedford County water and Lynchburg City sewer services—great long-term added convenience and value for an equestrian and show facility. 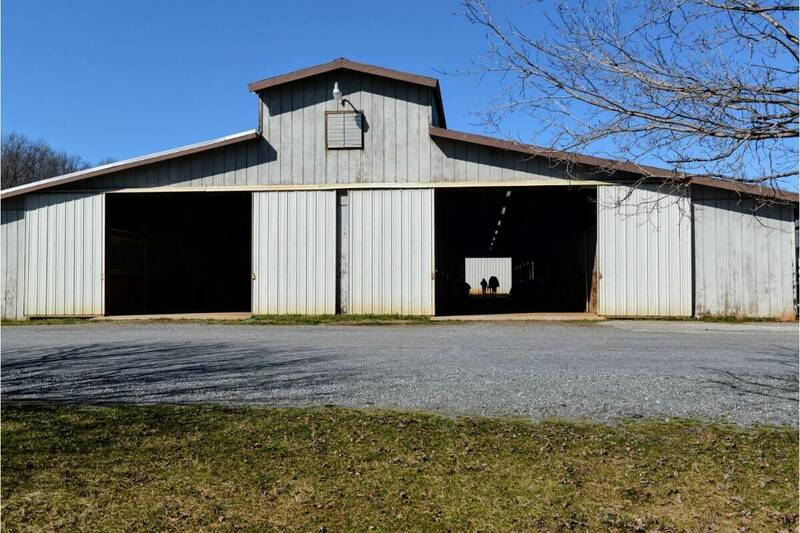 The first primary building is a 24-stall barn is a steel structure with a concrete slab foundation, metal walls and roof, with a steel beam support frame. 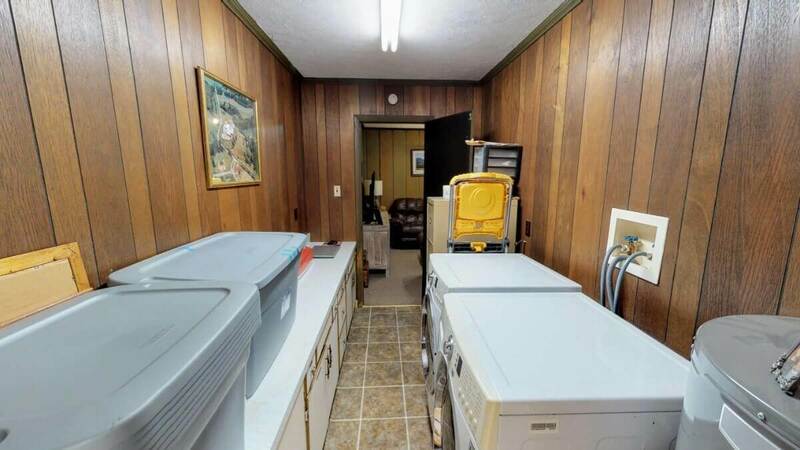 This building also contains a fully finished one-story, two-bedroom apartment with a full bath (3-piece), separate central living room, full kitchen, and a laundry area. 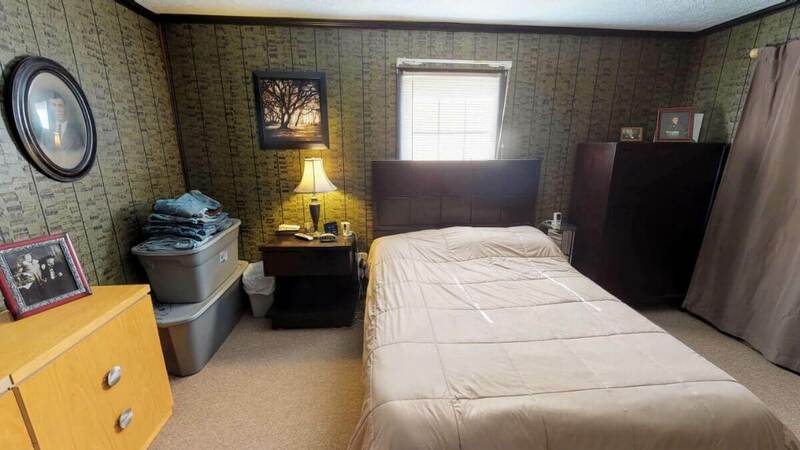 The apartment area is served by a separate HVAC system and also has supplemental gas log heat. 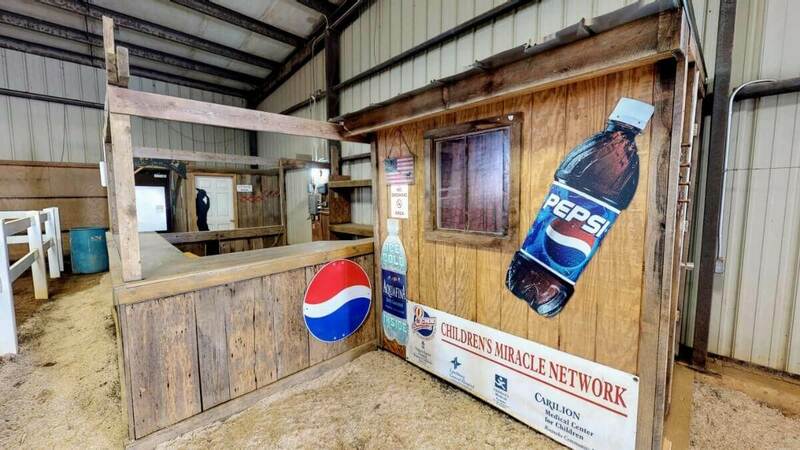 Within the barn/stable area, there is a separate finished room set up for use as a laboratory. 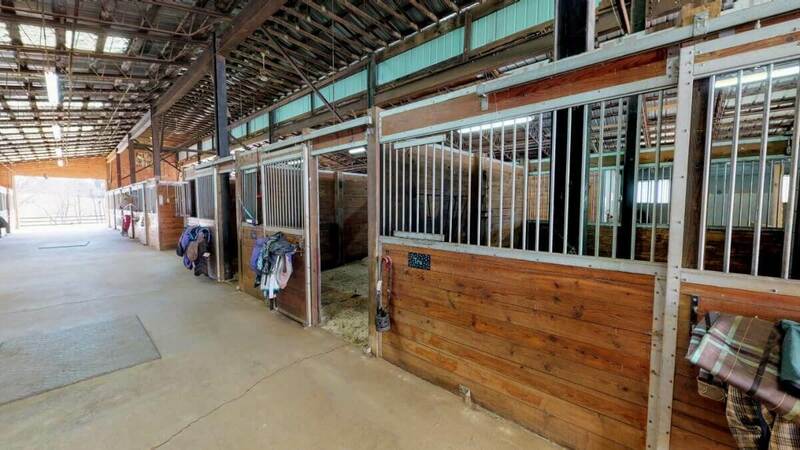 The barn area has concrete flooring, with 24 (12 x 14 ft.) wood-paneled, steel framed, rubber-matted stalls. Lighting consists of suspended fluorescent fixtures. 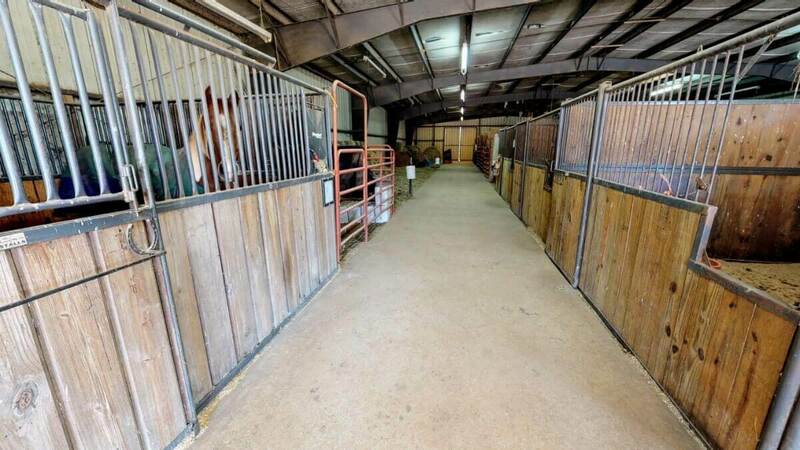 While the stable area has no central HVAC system, there are ample existing overhead ceiling fans in place. 400-AMP electric service is available throughout this building and electricity is available in each of the stalls. 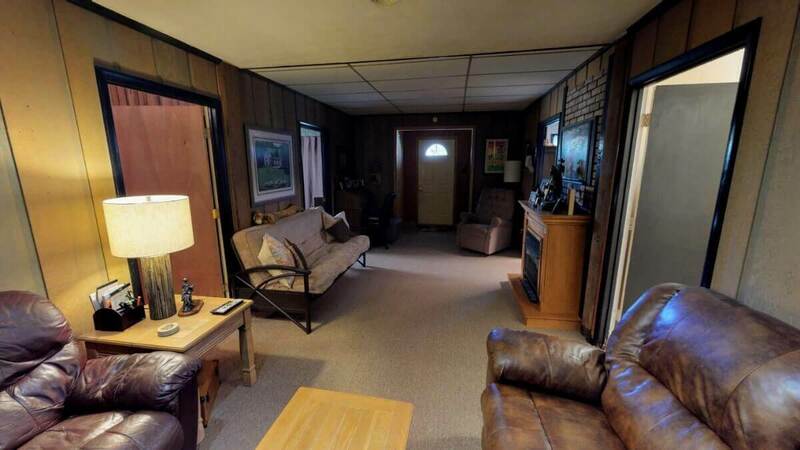 There are multiple finished tack rooms, and a finished office/lounge area. Additionally, there is a centrally located wash bay. 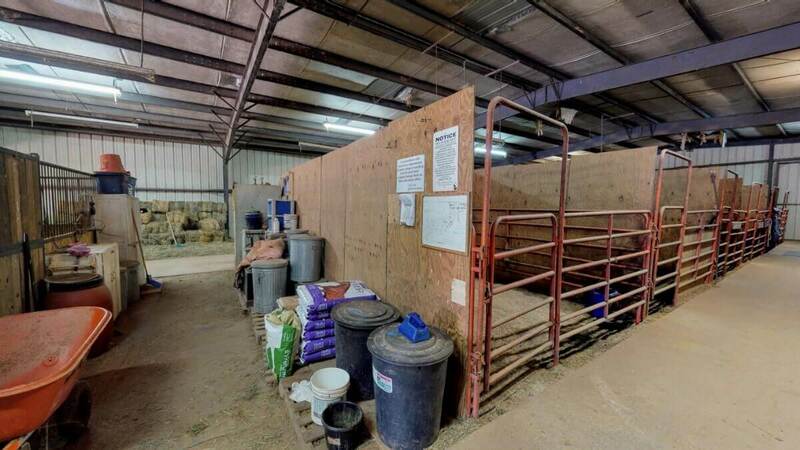 Entrances to this building consist of a covered pedestrian paneled door at the apartment entrance, and four oversized sliding bay doors in various locations in the stable area. The second primary building is a 15,000 sq. 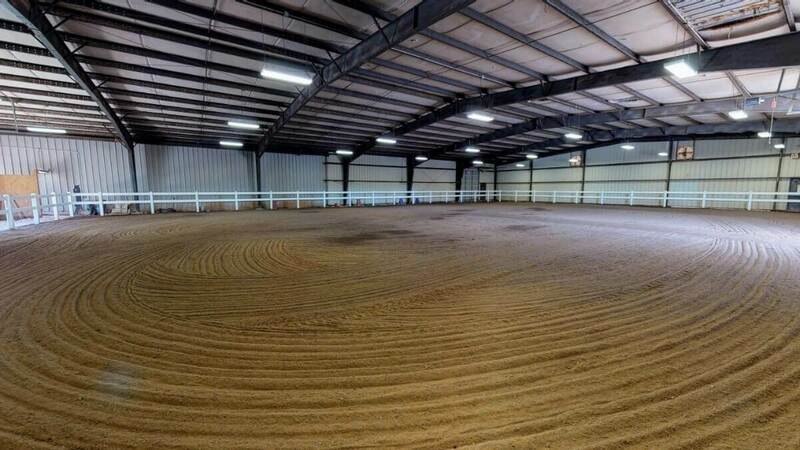 ft. 100 x 150 ft. indoor riding/show arena constructed of metal with an earthen floor. 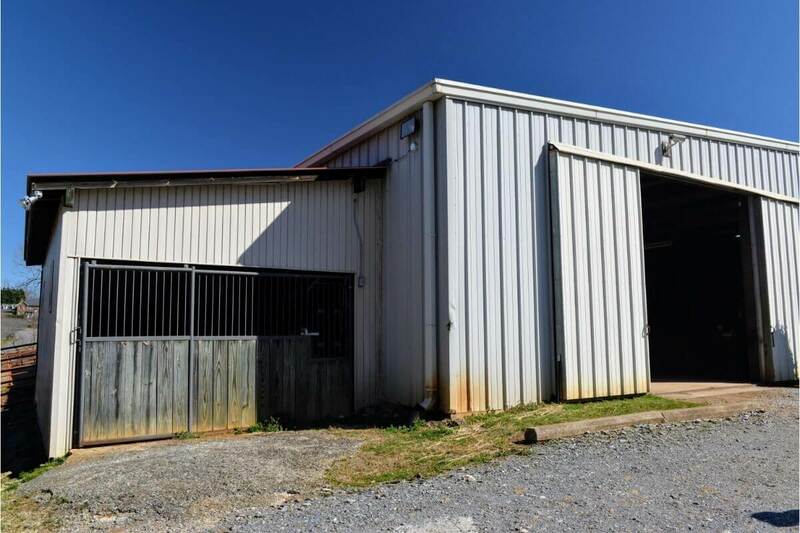 Access to this facility is provided via two metal pedestrian doors and two oversized roll-up metal bay doors on the front and the side of the building. Ceiling heights are approximately 16 ft. and there is suspended fluorescent lighting fixtures through-out. There is no central HVAC in this building, but 100-AMP electricity is available. 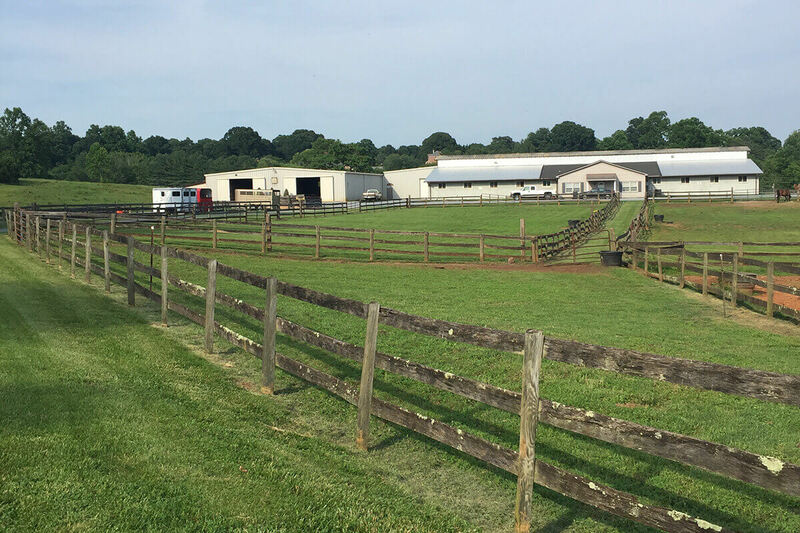 Commercial grade white vinyl fencing is in place around the arena area, along with movable metal paddock fencing, a designated EMT area, concession area, and changing room. In the past, this arena building was equipped with metal bleacher type seating for 1,200 spectators and could be so equipped in the future if needed. The third primary building is a 10,500 sq. 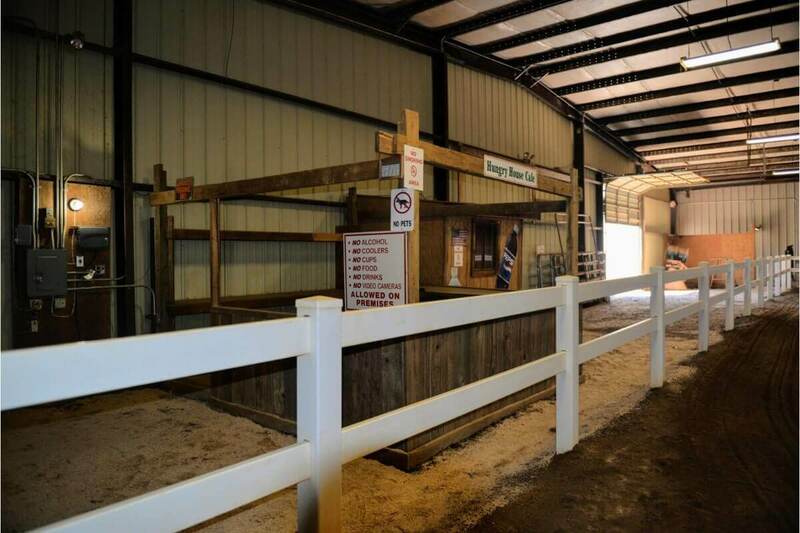 ft. 28-stall barn with concrete flooring, and 28 (12 x12 ft.) wood-paneled, steel framed, rubber-matted stalls. 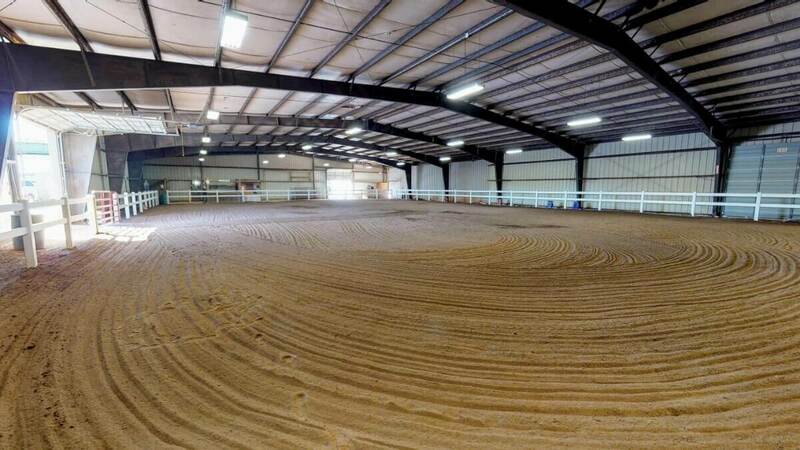 As in the other barn, lighting consists of suspended fluorescent fixtures. The roof and the walls are insulated metal panels. 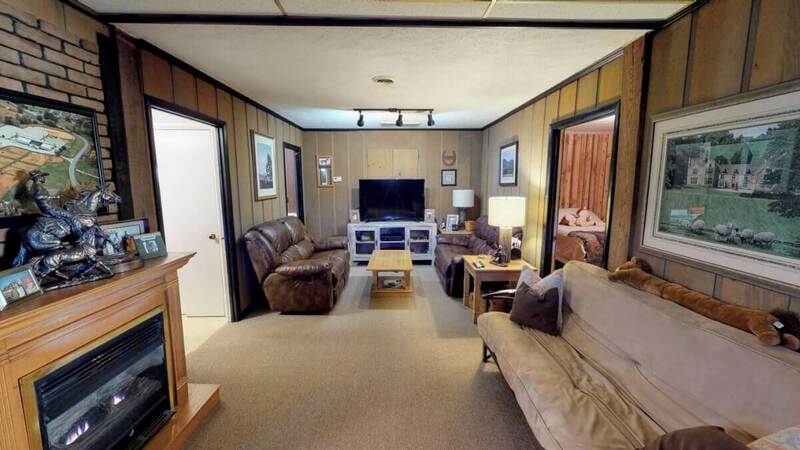 While there is no central HVAC, there are overhead ceiling fans and exhaust fans. Electric service of 400-AMP is available throughout the building, with electric available in each of the stalls. 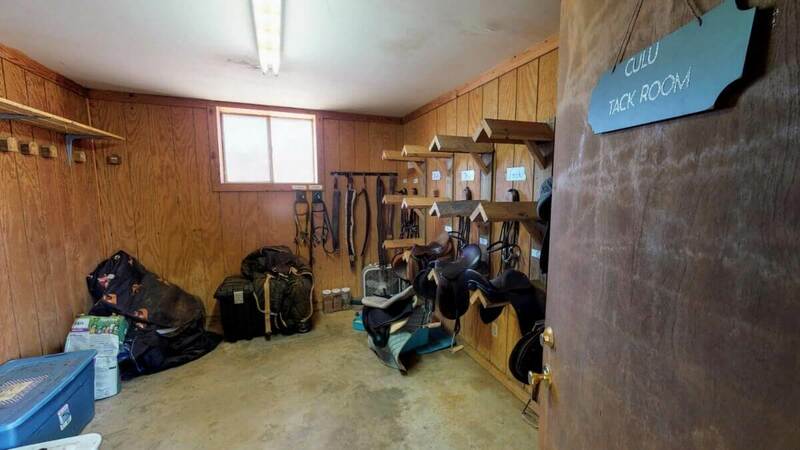 This building also has multiple tack rooms, and there is also a finished lab area. Entrances consist of four oversized sliding bay doors. 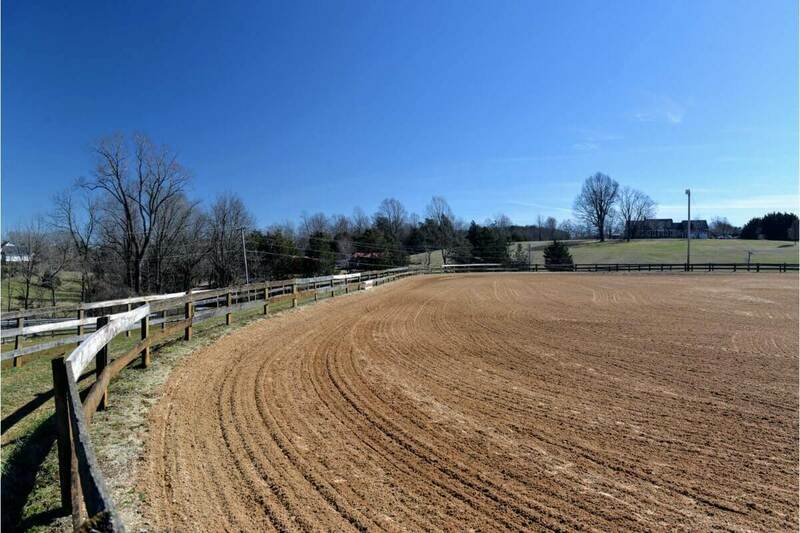 Adjacent to these barn structures is a 150 x 250 ft. lighted, outdoor riding arena with wood fencing and a built-up sand base. 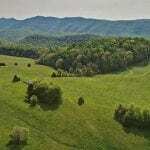 Overall outdoors, approximately 8 acres is enclosed with wood fencing, some moveable metal fencing, and cross fencing which measures around 8,000 linear feet. It’s all here, and turn-key! At the current boarding rates of $675 per month full-board or $250 per month for stall space only, the top-line revenue opportunity just from boarding is in the annual range of $421,000 down to $156,000—dependent upon the actual mix of boarding service. 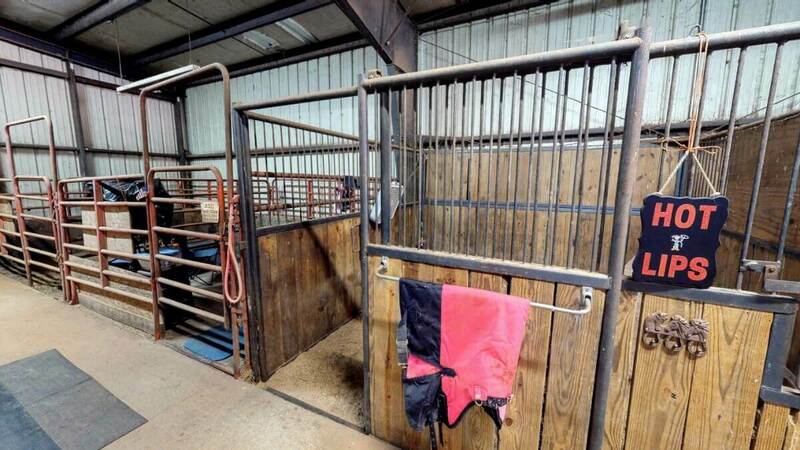 Lessons, horse rentals, and other related services could add another significant revenue stream. 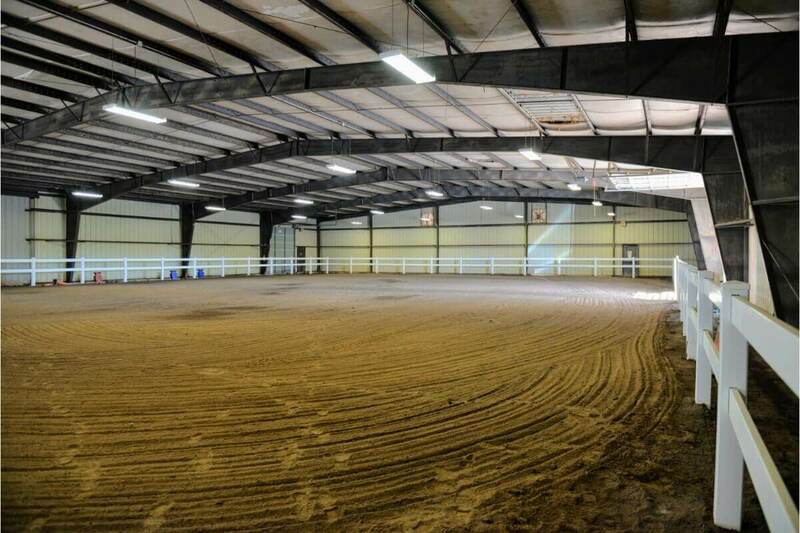 And, creative use of the large indoor arena for special events, shows, entertainment, etc. could also add significantly to top line revenue. 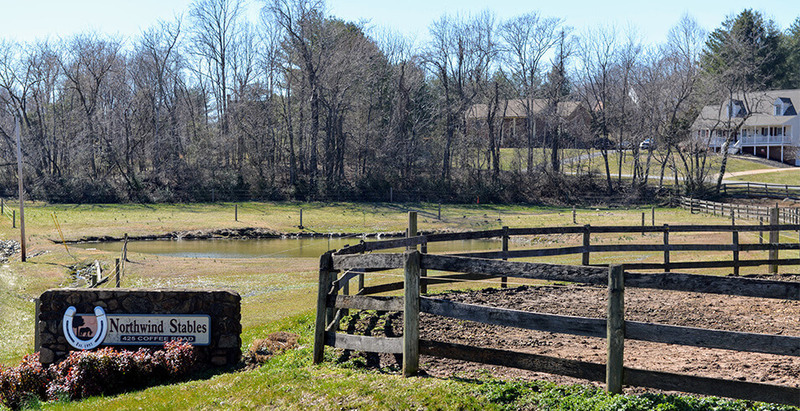 So, come live the equestrian life-style and earn a good living doing what you love—it’s all about the horses and satisfying your “inner-equestrian” self! 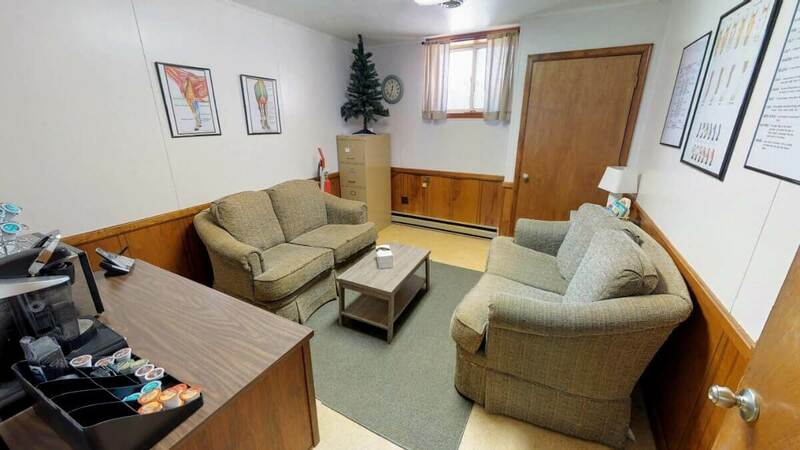 Live in the on-site apartment while building your business, and perhaps while building a new home elsewhere on the ample acreage. 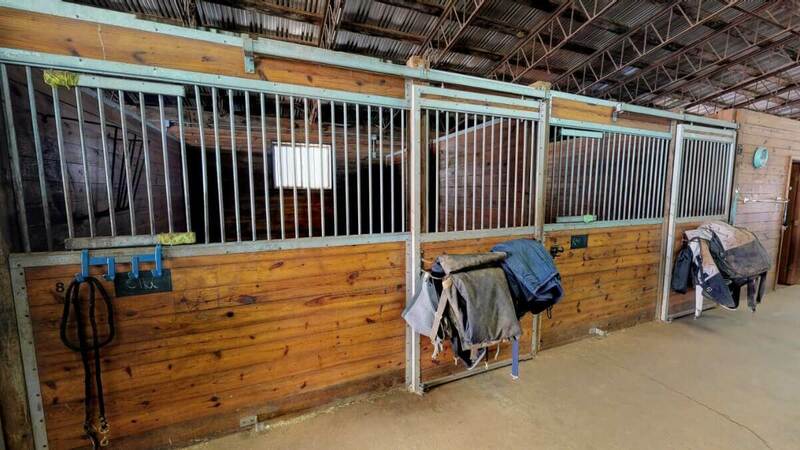 Longer term, when you are ready to move on from the commercial equestrian business—either sell the property and business, or stay put in your separate residence on the property and sell the remainder as prime residential building lots to individuals or a developer. This offering is jam-packed with opportunity, business potential, and long-term value.